Plot Summary: A SWAT team becomes trapped in a tenement run by a ruthless mobster and his army of killers and thugs. What The Raid: Redemption successfully achieves is it makes the onscreen violence threatening once again. There’s no joke in these fights, everybody is fighting to kill and is doing it as efficiently as they can so they can get to the next guy without a moment’s rest. It’s brutal, tough and had me cringing at many instances. It was very much a throwback to 80’s Hong Kong action cinema. The story is simple enough to set up the action scenes but still manages to give some twists and turns. A trope I often look forward to in martial arts/action films is the henchmen. A good characterized henchman can add a lot of dimension to story as well as build up to the final climax. There’s a real badass henchman here who’s genuinely a scary mofo. The henchman stole the show! Iko Uwais is a charming martial arts leading man. Gareth Evans and him seem to have a good thing going, hopefully they can keep working together in future projects. Speaking of which, they’ve already planned a sequel to this movie. I can’t help but wonder how they’ll top the fights in a second film. I look forward to it nonetheless. Highly recommended. One of the best surprises of 2012. 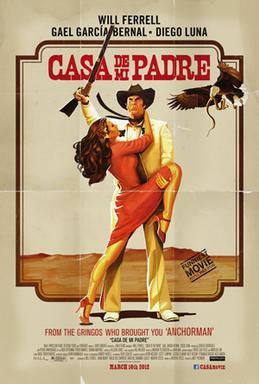 Plot summary: Casa De Ma Padre tells the story of Armando Álvarez (played by Will Ferrell), who must save his father’s ranch from a powerful drug lord. I am not a fan of Will Ferrell’s comedy. The only two Will Ferrell performances that I liked were his parts in Stranger Than Fiction and Jay and Silent Bob Strike Back. The only reason I took interest in Casa De Ma Padre was that the trailer had me on the floor when I first saw it on Apple Trailers. It’s my belief that you should never totally write somebody off. So I decided to check this one out. So thoughts? It’s not as funny as it ought to be. I laughed a total of four times – the 2 major laughs was over the song number “Yo No Se” (Spanish for “I don’t know”) and a gag with an animal puppet. The film relies mostly on all the B-movie gags done in the faux trailers in Grindhouse to give you a B-movie feel – bad cuts, blaring continuity errors and entire reels missing. That B-movie gag has officially run its course. There was something admirable about Will Ferrell learning Spanish just to be funny in a film. The language barrier forces more discipline in Ferrell’s comedic performance than the usual “Will Ferrell Random Comedy Theater”. Often times, it’s too easy when a comedian can stop committing to a moment and go into another bit right away to milk a laugh. The story for the most part is relatively serious, which I did not expect for a Will Ferrell movie. The actors are all playing it straight but partly because we’re experiencing the story through its sometimes intentionally erroneous subtitles, it’s not being played straight enough for it be ironic. It’s like watching a big inside joke that you can’t laugh at because everybody else won’t let you in on the joke. Strangely, I found myself going along with the story instead of the jokes and sat through the rest of the film to see how the story would play out. Perhaps if the story was more comedic in its own structure, the gags would have been punctuated for a more comedic experience. Casa De Ma Padre is not terrible, but it was a weird experience and I cannot fully recommend it on the basis that it’ll make you laugh. In the end, the whole essence of the film’s humor is unfortunately all in the trailer itself. Plot summary: Martin, a mercenary, is sent from Europe by a mysterious biotech company to the Tasmanian wilderness on a hunt for the last Tasmanian tiger. 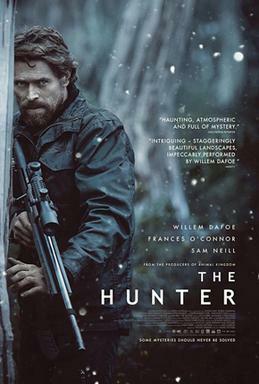 Willem Dafoe carries the entire film with a quiet natural performance. You simply believe him as a hunter/mercenary, particular in the physical way how he moves in the wilderness, handles the tools and weapons. He brings the heart to an otherwise cold story with all its philosophical cerebral themes. This is an existential loner movie. It presents a lone man against nature as an overwhelming void that the hero must face, come out of it and find some meaning to life. The story asks this of it’s protagonist and also the audience. And for that, The Hunter gives back as much as the viewer is willing to invest into it. The film’s themes cover a variety of things including corporate greed, man vs. nature, man’s purpose in the empty universe and what is humanity. Yes it’s a thinking man’s movie. So for any viewers who may not want to put in so much work, it could be a tame experience. I merely focused on the the human story about the protagonist regaining his humanity, which gripped me. I regretted that I did not invest enough into The Hunter on the first viewing to get the satisfaction from its philosophical themes. For that, I plan to watch it again.